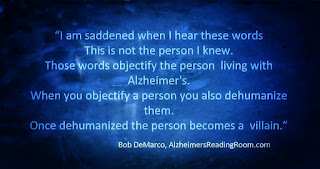 In order to communicate effectively with a person living with Alzheimer's disease you need to come to an understanding that they are now living in a new world -- I often refer to this place as Alzheimer's World. When I hear these words -- this is not the person I knew, I am greatly saddened. In most cases the person speaking these words is angry, in a constant state of angst, or confused. The look on their face tells the story. The tone of their voice sounds like a cry for help. It is not hard for me to understand how an Alzheimer's caregiver might come to this conclusion. Alzheimer's disease is difficult to understand, hard to accept, and is disconcerting. The behavioral changes that come with Alzheimer's disease cause the caregiver to experience a range of negative emotions that come on with a power that is equivalent to a human tsunami. Anger, sadness, feelings of hopelessness, and the inability to "cope" are common. Resultant depression is common. Concluding or believing that the person you know, is not the person you know, is an easy way to make sense of something that is very difficult to understand. This easy, erroneous conclusion, does comes with a consequence that is psychologically devastating and debilitating. This conclusion brings with it an almost certain outcome -- the inability to deal with Alzheimer's disease in an effective manner. Alzheimer's is an illness. A disease in the brain. It differs from most other diseases because it lasts for years, often more than a decade. There is no cure. The person you know is still the same person with one simple exception -- they are ill. They suffer from a disease. They suffer from Alzheimer's disease. Alzheimer's disease changes the way a person talks, acts and behaves. The person living with Alzheimer's disease often becomes mean. Meanness is a symptom of the disease. Meanness comes as a result of the Alzheimer's sufferers inability to cope with their surroundings. Alzheimer's brings with it a cognitive dissonance that is hard to imagine. This dissonance, these unsettling feelings, cause conflicts within the person living with Alzheimer's. These internal conflicts often cause the sufferer to act out with behaviors that appear to be completely irrational. This is a symptom of Alzheimer's disease. The inability to use all their faculties, to organize their mind, often leads to feelings of insecurity, fear, anger, and hostility among those living with Alzheimer's. You can think of this as being confused times 100. Alzheimer's sufferers live in a near constant state of confusion caused by the brains inability to sort out stimuli. I sometimes think of this like a brain that is cracked. The brain still works but it can no longer do all the things it once did. 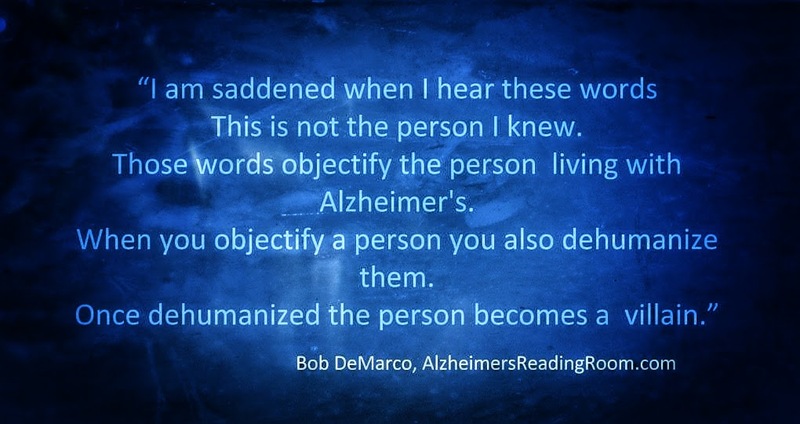 I am saddened when I hear these words --this is not the person I knew -- because those words objectify the person suffering from Alzheimer's. When you objectify a person you dehumanize them. Once dehumanized the person becomes a villain. Objectification leads to vilification. Vilification leads to dehumanization. This same cause and effect becomes a road block to effective caregiving. A kind of insurmountable brick wall that stops the caregiver from overcoming denial and becoming an effective loving, caring, caregiver. A caregiver might believe that Alzheimer's is the villain, but if their behavior becomes one of objectification it is likely that the sufferer becomes the recipient of the anger -- the villain. Once this occurs the communication takes on a negative pattern that is hard to change. Imagine two angry people. Imagine what they might say, or feel. Imagine if they somehow continued to live together year after year in a constant state of anger, in a constant state of conflict. Imagine. 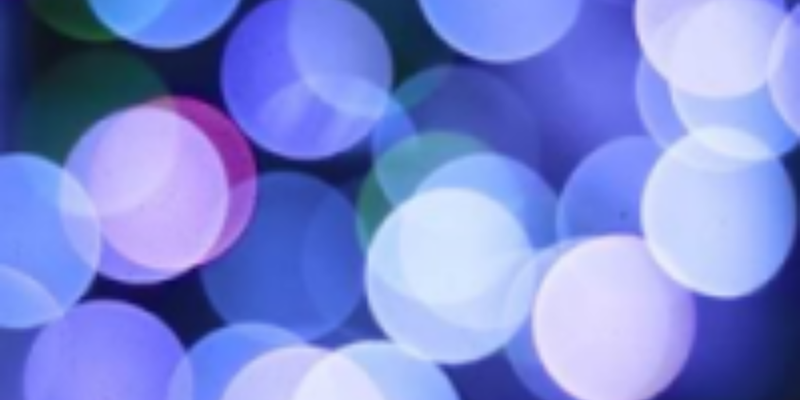 In order to communicate effectively with a person living with Alzheimer's disease you need to come to an understanding that they are now living in a new world -- I often refer to this as Alzheimer's World. The person living with Alzheimer's did not choose to go into this new and bizarre world. They are not acting irrational by design or with intent. They are acting irrational because their brain is not functioning properly. This is being caused by the Alzheimer's disease. It is very difficult as an Alzheimer's caregiver to understand and accept that the behavior of a person suffering from Alzheimer's is a direct result of the progression of the disease. The person expressing these behaviors is the same person you have known throughout your life. Alzheimer's caregiving at its core is all about change and acceptance. Most people have trouble dealing with change. The change that comes with Alzheimer's disease is so dramatic and so enormous that it takes a long time to digest and understand. It takes years to become comfortable with Alzheimer's. Objectifying the Alzheimer's sufferer brings helps some caregivers to cope. It is their way of coping. Objectification brings with it an enormous amount of pain. It is likely that this pain will remain with the caregiver throughout their life. It is likely they will remain "mad" at Alzheimer's for ruining their life. Is there a solution to this problem? I believe there is. First, you need to come to the realization that the person suffering from Alzheimer's is the person you knew throughout your life. You'll need to accept that the behaviors you are seeing are a direct effect of illness -- Alzheimer's disease. You'll need to develop a new set of communication skills that will allow you to deal with the behavior of the person living withAlzheimer's, and at the same time allow you to slay the dragon within you. Alzheimer's is a sinister disease. It kills brains. It will kill the brain of the person suffering from Alzheimer's. It will also try to kill the brain of the Alzheimer's caregiver. My mother is still the same person I have known all my life. She lives with Alzheimer's. Her brain sends her the wrong signal quite often. So its up to me to let her use my brain when necessary. This is what I do. It works. you'll be the person you always knew and therein lies the solution to the problem.